When investors are investigating a specific market, where do they source the most powerful information? The 2014 Top Ontario Investment Towns report is rooted in economic fundamentals and details the best places in the province for investment. Discover the complete list and find out who ranked #1 in the complete report! The 146-page report analyzes the current and future prospects for real estate investment opportunities in the province, and identifies the top regions that will outperform in the coming decade. Which cities made the list? 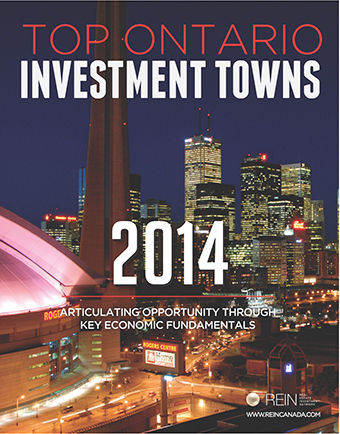 Download the FREE Top Ontario Investment Towns report by providing your information in the form below. A best-selling author with an investing career spanning over four decades, Don R. Campbell brings a unique perspective to the Canadian real estate market. He has appeared on countless radio stations, national and international television news programs and is one of the nation’s most sought after sources for real estate market research and education. With a portfolio nearing 200 properties, Don R. Campbell proves that real estate investment is a realistic option for creating financial certainty. For his latest insights, you can check him out on Twitter -- @DonRCampbell.